Sponsor A Youth. Create Jobs. Grow Your Business. Employment opportunities for teens and early 20-somethings have plummeted in recent years. Just 26% of teens ages 16 to 19 had a job in 2011, down from 45% in 2000. Young adults are the hardest hit employee group in the USA. The job opportunities are extremely scarce, especially in Indiana. If our young adult population doesn’t get basic employment soft skills training during their high school and post-secondary education years, they will struggle fnding their first job or career position. The Blue Zone, Inc. is a not-for-profit organization that matches young adults, who specialize in Social Media, with employers who need Social Media in their marketing mix. 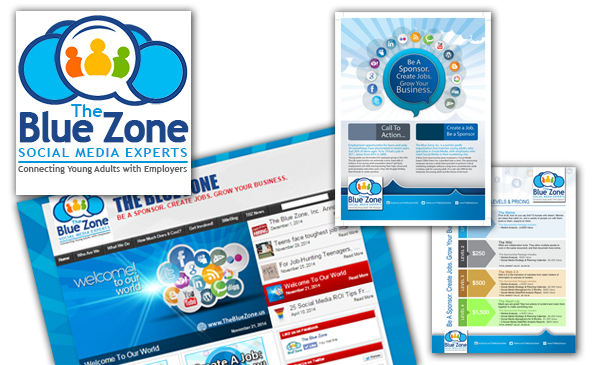 A Blue Zone Sponsorship gives employers a Social Media Expert (SMe) Intern for a specialized task or term. The sponsoring employer receives a dedicated specialist to perform critical marketing strategies without a long-term commitment, while creating a job for a young adult. It’s a win-win-WIN for the employer, the young adult and the future of the local economy. VISIT www.TheBlueZone.us and get started TODAY!